Locally owned and celebrating 30 years of successful business. 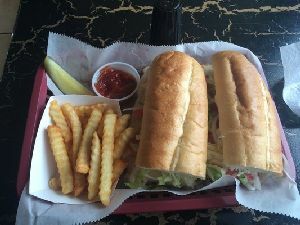 Offering a variety of hot and cold subs and other selection of sandwiches. Their ice cream is soft serve vanilla and chocolate. They make freely made milkshakes, sundaes, splits and dipped cones. They slow cook the roast beef for the Philly cheese sandwiches. Known in the area of having the best hot dog chili. They do it the old fashioned way and do a great job. The place is very clean, friendly staff and great prices. We enjoyed a large loaded Philly sub with fries. Great job!